1 And after these things I saw another angel come down from heaven, having great power; and the earth was made bright with his glory. 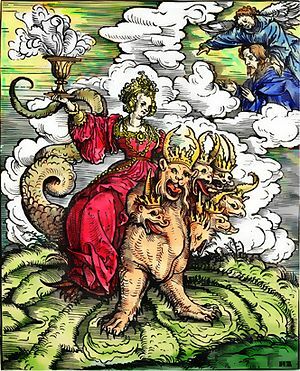 2 And he cried mightily with a strong voice, saying, Babylon the great is fallen, is fallen, and is become the habitation of demons, and the haunt of every foul spirit, and a cage of every unclean and hateful bird. 3 For all nations have drunk of the wine of the wrath of her fornication, and the kings of the earth have committed fornication with her, and the merchants of the earth have grown rich through the abundance of her luxury. 5 For her sins have reached unto heaven, and God has remembered her iniquities. 6 Reward her even as she rewarded you, and double unto her double according to her works: in the cup which she has filled, fill to her double. 7 So much as she has glorified herself, and lived luxuriously, so much torment and sorrow give her: for she says in her heart, I sit a queen, and am no widow, and shall see no sorrow.